The award-winning research project virtusMED (Virtual Scenes for Medical Education and Diagnostics) deals with intuitive human-machine interfaces for exploring volumetric medical image data. 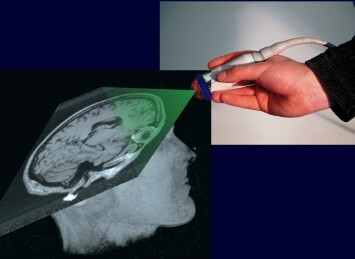 A computer system was developed which provides a hand-held probe or a 3D mouse to interact in real-time with a virtual 3D scene that presents CT, MRI, 3D ultrasound or photographic slice image data. In particular, the tool allows for an easy selection of reformation planes or slabs (of arbitrary orientation) and appropriate 3D views in real-time. 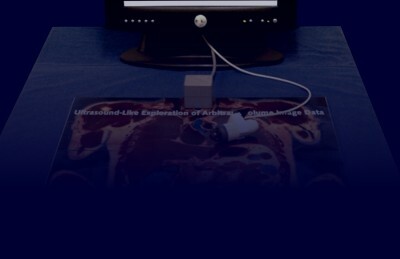 Using image data from the National Library of Medicine’s Visible Human Project and corresponding segmentation data, virtusMED provides a virtual patient for learning gross anatomy and principles of medical imaging, especially sonography. A DICOM interface allows to read actual patient data, making virtusMED a powerful tool for diagnostic purposes. The system can be supplemented by a head-mounted display and a freely movable flat screen to make it even more intuitive.